Cyber Security refers to the protection of systems connected to the internet such as data, software, and hardware from cyber-attacks. The global cyber security market is predicted to grow at 11.1% CAGR during the forecast period with the market size reaching USD 282.3 billion by 2024. Different solutions including firewall, encryption, identity and access management, security, and vulnerability management are majorly contributing to the cyber security market size. The market has witnessed significant demand for these solutions and services over the last few years due to the increasing internet penetration globally and the simultaneous increase in cyber-attacks. Based on components, the cyber security market is categorized into solutions and services, of which solutions hold the larger share in the cybersecurity market, globally. The increasing number of new entrants providing security services against cyber-attacks and increasing concern regarding the data security and privacy led to the faster growth of the services segment during the historical period, which is also predicted to continue during the forecast period. 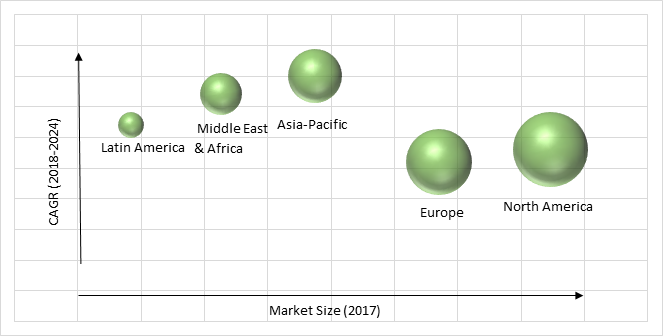 Among different types of security solutions (identity and access management, security and vulnerability management, risk and compliance management, encryption, firewall, unified threat management, web filtering, disaster recovery, distributed denial of services mitigation, antivirus or antimalware, data loss prevention, and intrusion detection systems), web filtering solution market is predicted to grow at the fastest CAGR during the forecast period. Among the different types of services (managed and professional), managed security services market size will witness the faster growth during the forecast period in the cyber security services market. On the basis of deployment type, the cyber security market is segmented into cloud-based and on-premise. Of both, cloud-based category is predicted to witness the higher CAGR of 15.1% during the forecast period due to the higher susceptibility of cloud-based systems to cyber-attacks. On the basis of security type, the market is segmented into network, endpoint, wireless, application, cloud, and others. Of all, the cyber security market size for application security is expected to grow at the fastest rate during the forecast period, globally. Based on organization size, the market is segmented into small and medium enterprises, and large enterprises. The cyber security market size is larger for large enterprises; however, its growth rate is higher for small and medium enterprises due to the increasing awareness and increasing incidence of security breaches in these organization. Among different verticals including government and public utilities, aerospace and defense, BFSI, manufacturing, retail, healthcare, IT and telecom, and others, the cyber security market size for BFSI is predicted to grow at the fastest CAGR during the forecast period. BFSI sector is the target of the major cyber-attacks which requires these organizations to ensure high-level security from such threats, thus leading to the higher demand for security solutions and services against cyber threats and attacks. The stringent directives for data privacy, increasing number of cyber-attacks, increasing adoption of digital solutions by most industries, and increasing inclination towards cloud-based solutions from on-premise are the key factors leading to the growth in the cyber security market, globally. Owing to the security reasons, enterprises are inclining towards the usage of cloud-based solutions to keep data safe at third-party servers. However, with the increasing adoption of cloud-based solutions, the chances of cyber-attacks also increase, thus creating the huge demand for security solutions and services against cyber-attacks. Another key factor driving the growth of the industry is the increasing adoption of IoT solutions in healthcare, BFSI, and across other different industries. Key factors hindering the growth of the cyber security market are rapidly increasing distribution of pirated security solutions, and limitation of security budget against cyber-attacks especially in developing and underdeveloped countries. In addition, the dearth of skilled security professionals for cyber threats is also having a negative impact on the growth of the market. Geographically, North America is the largest cyber security market as the region is home to a large number of industry players and also spends a large amount of capital to tackle cyber threats. Asia-Pacific is observed to witness significant growth in the market during the forecast period. As the region comprises of a large population with internet access, the increasing penetration, and increasing awareness among masses and government bodies for tackling cyber threats and crimes. Market players in the cyber security industry are investing capital to develop technologically advanced systems for security and vulnerability management, risk and compliance management, and encryption among others. Hewlett Packard Enterprise, McAfee Inc., IBM Corporation, Symantec Corporation, Trend Micro, Inc., Check Point Software Technologies Ltd., Palo Alto Networks, Inc., Cisco Systems, Inc., Fortinet, Inc., Sophos Ltd., F-Secure, Kaspersky Lab, Webroot, Inc., and LogRhythm, Inc. are some of the key players offering solutions and services for cyber security. 11.6. Check Point Software Technologies Ltd.
11.7. Palo Alto Networks, Inc.
Table 267 Snapshot – McAfee Inc.
Table 270 Snapshot – Trend Micro, Inc.
Table 271 Snapshot – Check Point Software Technologies Ltd.
Table 272 Snapshot – Palo Alto Networks, Inc.
Table 273 Snapshot – Cisco Systems, Inc.
Table 274 Snapshot – Fortinet, Inc.
Table 274 Snapshot – Sophos Ltd.
Table 274 Snapshot – Webroot, Inc.
Table 274 Snapshot – LogRhythm, Inc.